Minimum requirements: 30mb of disk space, 10mb of memory to run. Batch & Print Enterprise End User License Agreement 1. APPLICATION1. 1. 1. This end user software license ("License") allows you to use software ("Software") made available on Traction Software Limited's website http://www.traction-software.co.uk subject to the terms of the License. This License is a legally binding agreement between you and Traction Software Limited, a UK limited company (registered number 4639269 ). 2. LICENSE1. 2. 1. Traction Software Limited grants you for the term of this License a limited, personal, non-exclusive license to: Use the Software in object code executable only form on a single computer owned, leased and/or controlled by you. 1. 2. 2.2. All rights not expressly granted to you under this License are reserved to Traction Software Limited, and you agree not to take or permit any action with respect to the Software that is not expressly authorised under this License. For the avoidance of doubt, you have no right to use, incorporate into other products, copy, modify, translate or transfer to any third party the Software or any modification, adaptation or copy of the Software or any part thereof, nor to decompile, reverse engineer, or disassemble the binary code of the Software, either in whole or in part, except as expressly provided in this License. 3. 2. 3. The Software is licensed to you only. You may not rent, lease, sub-license, sell, assign, pledge, transfer or otherwise dispose of the Software, on a temporary or permanent basis without the prior written consent of Traction Software Limited. 3. OWNERSHIP OF INTELLECTUAL PROPERTY RIGHTS1. 3. 1. Your only right to use the Software is by virtue of this License and you acknowledge that all intellectual property rights in or relating to the Software and all parts of the Software are and shall remain the exclusive property of Traction Software Limited or its licensors. 2. 3. 2. You further acknowledge that all intellectual property rights in or relating to any improvement, modification or adaptation of the Software arising directly or indirectly from you using the Software are and shall remain the exclusive property of Traction Software Limited. 3. 3. 3. You agree that you will not remove or alter any copyright notices or similar proprietary devices, including without limitation any electronic watermarks or other identifiers, that may be incorporated in the Software or any copy of the Software. 4. CONFIDENTIALITY1. 4. 1. The structure, organisation and source code of the Software are the valuable trade secrets and proprietary confidential information of Traction Software Limited and its licensors. You agree not to provide or disclose any such confidential information in the Software or derived from it to any third party. 2. 4. 2. The provisions of clause 4 . 1 will not apply to any information which is: 1. 4. 2. 1. lawfully obtained free of any duty of confidentiality (otherwise than directly or indirectly from Traction Software Limited); or 2. 4. 2. 2. already in your possession, provided that Licensee can show such possession from written records (other than as a result of a breach of this clause 4 ); or 3. 4. 2. 3. which you can demonstrate is in the public domain (other than as a result of a breach of this clause 4 ). 3. 4. 3. To the extent that any information is necessarily disclosed pursuant to a statutory or regulatory obligation or court order, such disclosure shall not be a breach of this clause 4 provided you do what you can to prevent any such disclosure. 5. WARRANTY AND SUPPORT1. 5. 1. The Software is provided “as is” with no representation, guarantee or warranty of any kind as to its functionality or that it does not and will not infringe any third party rights (including intellectual property rights). Traction Software Limited will give free email support for the duration of the product life (at least 5 years from the time of purchase), all minor upgrades are free of charge. e.g. v1.02 to v1.03. any major version upgrades will incur a 50% charge of the original price and is an optional upgrade. 6. LIMITATION AND EXCLUSION OF LIABILITY1. 6. 1. Traction Software Limited does not exclude its liability (if any) to you: 1. 6. 1. 1. for personal injury or death resulting from Traction Software Limited’s negligence; 2. 6. 1. 2. for any matter for which it would be illegal for Traction Software Limited to exclude or to attempt to exclude its liability; or 3. 6. 1. 3. for fraud. 2. 6. 2. Traction Software Limited makes no express warranties with respect to the Software and Traction Software Limited hereby excludes (to the fullest extent permissible in law), all conditions, warranties (including without limitation any warranty that the Software will meet your requirements or that its operation will be uninterrupted or error free) and stipulations, express (other than those set out in this License) or implied, statutory, customary or otherwise which, but for such exclusion, would or might subsist in favour of you. Except as set out in this License you assume the entire risk as to the quality and performance of the Software. 3. 6. 3. Subject to clause 6. 1 Traction Software Limited will be under no liability to you whatsoever (whether in contract, tort (including negligence), breach of statutory duty, restitution or otherwise) for any injury, death, damage or direct, indirect or consequential loss (all three of which terms include, without limitation, pure economic loss, loss of profits, loss of business, loss of data, loss of savings, depletion of goodwill and like loss) howsoever caused arising out of or in connection with: 1. 6. 3. 1. the Software, or the manufacture or sale or supply, or failure or delay in supply, of the Software by Traction Software Limited or on the part of Traction Software Limited’s employees, agents or sub-contractors; 2. 6. 3. 2. any breach by Traction Software Limited of any of the express or implied terms of this License; 3. 6. 3. 3. any use made of the Software; or 4. 6. 3. 4. any statement made or not made, or advice given or not given, by or on behalf of Traction Software Limited. 4. 6. 4. Subject to clause 6. 1 and without prejudice to clauses 6. 2 and 6. 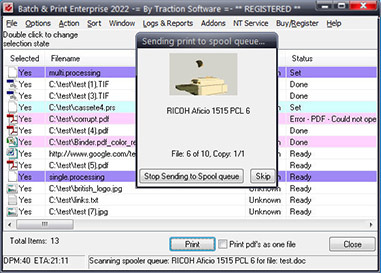 3 , Traction Software Limited’s aggregate liability under this License(whether in contract, tort (including negligence), breach of statutory duty, restitution or otherwise) for any injury, death, damage or direct or consequential loss (all three of which terms include without limitation of profits, loss of business, depletion of goodwill and like loss) howsoever caused (other than for death or personal injury caused by Traction Software Limited’s negligence) will be limited to the higher of the price paid by you to use the Software or USD $1 00. 5. 6. 5. You acknowledge that the above provisions of this clause 6 are reasonable given the charges made (if any) for the Software and you will accept such risk and/or insure accordingly. 6. 6. 6. Any rights that you have as a consumer are not affected by this clause 6. 7. TERM AND TERMINATION1. 7. 1. This License shall commence upon the earlier of your acceptance of this License or your installation of the Software and shall continue until terminated in accordance with clause 7. 2 or otherwise in accordance with this License. 2. 7. 2. This License will terminate automatically if fail to comply with any term or condition of this License or if you uninstall/destroy or voluntarily return the Software to Traction Software Limited. 3. 7. 3. Upon termination of this License for any reason whatsoever you must uninstall the Software and destroy, and upon request of Traction Software Limited certify the destruction of, all copies of the Software including all components of it in your possession. 4. 7. 4. The termination of this License howsoever arising is without prejudice to the rights, duties and liabilities of either party accrued prior to termination. Clauses 2 . 2 , 2 . 3 , 3 , 4 , 5, 6, 7. 3 , 8, 9 and 1 0 of this License will continue to be enforceable notwithstanding termination. 8. GOVERNING LAW AND JURISDICTION1. 8. 1. The formation, existence, construction, performance, validity and all aspects whatsoever of this Licence or of any term of this Licence will be governed by the law of England and Wales. 2. 8. 2. Subject to clause 8. 3 the courts of England and Wales will have exclusive jurisdiction to settle any disputes which may arise out of or in connection with this Licence. The parties irrevocably agree to submit to that jurisdiction. 3. 8. 3. The agreement contained in clause 8. 1 above is included for the benefit of Traction Software Limited. Accordingly Traction Software Limited retains the right to bring proceedings in any other court of competent jurisdiction. You irrevocably waive any objection to, and agree to submit to, the jurisdiction of such other courts. 4. 8. 4. You irrevocably agree that a judgment or order of any court referred to in this clause is conclusive and binding upon you and may be enforced against you in the courts of any other jurisdiction. 9. COMPLIANCE WITH APPLICABLE LAW1. 9. 1. You acknowledge and agree that notwithstanding the fact that this Licence is governed by the laws of England and Wales , you may be subject to additional laws in other jurisdictions with respect to your use of the Software. You will comply with the laws of any jurisdiction that apply to the Software, including without limitation any applicable export laws or regulations. 10. GENERAL1. 10. 1. If any clause or part of this License is found by any court, tribunal, administrative body or authority of competent jurisdiction to be illegal, invalid or unenforceable then that provision will, to the extent required, be severed from this License and will be ineffective without, as far as is possible, modifying any other clause or part of this License and this will not affect any other provisions of this License which will remain in full force and effect. 2. 10. 2. No failure or delay by any party to exercise any right, power or remedy will operate as a waiver of it nor will any partial exercise preclude any further exercise of the same, or of some other right, power or remedy. 3. 10. 3. This License contains all the terms which the parties have agreed in relation to the subject matter of this License and supersedes any prior written or oral agreements, representations or understandings between the parties in relation to such subject matter. 4. 10. 4. Traction Software Limited reserves the right to revise the terms of this License by updating the License on its web site, or by notifying you by post or by e-mail. You are advised to check this License periodically for notices concerning revisions. Your continued use of the Software shall be deemed to constitute acceptance of any revised terms. 5. 10. 5. You may not assign the benefit (including any present, future or contingent interest or right to any sums or damages payable by either party under or in connection with this License) or delegate the burden of this License or hold this License on trust for any other person 6. 10. 6. You will be deemed to have accepted the terms of this License by installing the Software onto any computer. Batch & Print Enterprise End User License Agreement 1. APPLICATION1. 1. 1. This end user software license ("License") allows you to use software ("Software") made available on Traction Software Limited's website http://www.traction-software.co.uk subject to the terms of the License.